This weekend, I’m going to read over the edits and send “The Devil Within” back to my editor. I must have told myself this about a thousand times as I watched the clock tick by. I didn’t literally or figuratively watch the clock. I mostly spent time with my family, because it was Easter weekend. I am not religious, but I was raised in the church. Everyone in the south seems to be. When Christmas and Easter come around, it’s a big deal. We had egg hunts galore, including one for my daughter’s daycare where the organizer brought an ice cream truck. Boy, that was popular! We know have candy pouring out of our ears–the dentist will be happy to see us coming soon. And we spent time with our family. The thing is, my edits are done, but I really want to read through one more time and make sure no more changes need to be made. I’m also a hater of conflict, and there are several suggestions my editor made that I don’t agree with. I’m done procrastinating TODAY. I keep telling myself just to finish the darn editing. After all, the sooner it’s finished the sooner I can move on with edits on my other works. Having your work edited is so hard mentally. Being a writer means you’re a creator of sorts. You create a world for your characters to live in, and when someone shoots that all down or doesn’t understand where you’re coming from. It can be quite hard to accept. It’s all part of being a writer though. Whoever said writing was easy? No one ever. I’m glad I put editing on the back burner this weekend though, because I was able to spend a lot of quality time with my three growing kids. One day, they’re not going to want to wake up at the crack of dawn to see what the Easter bunny left. One day, Easter egg hunts are going to be things of the past. Until then, I need to enjoy these little moments. I’ll leave you with this little gem from the weekend. 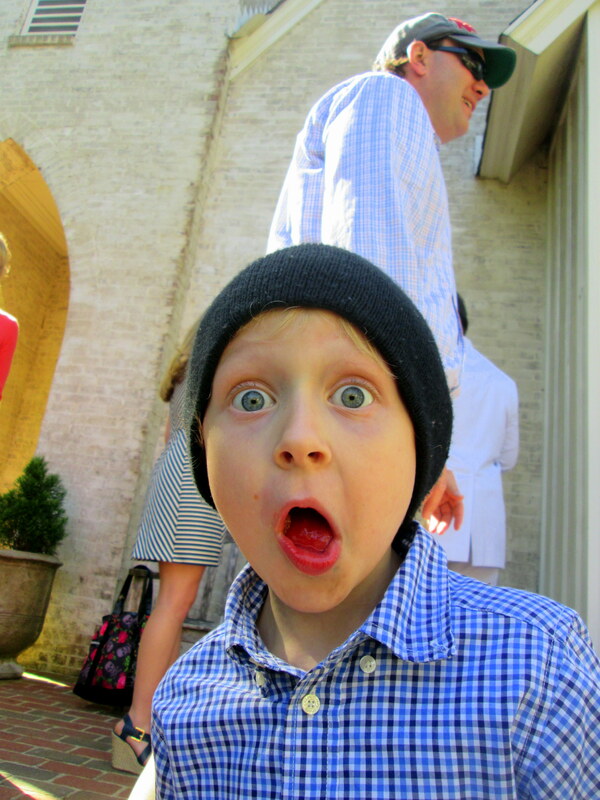 I usually try to keep my personal and writing blog separate, but this photo of my middle boy is just priceless. Happy Belated Easter! I know. Sometimes it’s good to just let it be and come back to it when there’s not so much going on! I just read your blog, and my little one in that picture is named Liam too! Helen–I’ve heard a lot of folks get defensive when the editor gets their claws on their work. It’s hard to let go of that control. I’m learning every day. Glad you had a nice Easter with your family. Easter is the one holiday we never enjoyed from an Easter Egg Hunt/Bunny point of view as my sons have food allergies and are allergic to eggs, dairy and nuts. Family time is always nice though! I know! It’s not such a common name in the South. We loved it, and it went well with our other son’s name. He’s so cute! I took a video of my 3yo trying to open her egg beating it with a wooden spoon! Yes editing is damn hard! Keep going!!! You’re doing good! Thanks Franny! Kids are so funny. I love watching them grow and explore. He is so cute. Holy cow the candy and treats in daycare and school. I swear I don’t remember having parties at school being quite so extravagant. My kids lose interest before they even finish their hauls from all these events. I hope the edits aren’t too painful. My kids are candy-aholics. They would eat it for breakfast, lunch and dinner if they could! Thanks–I’m working through them. Lauren, love the photo and the tale of time spent with family rather than facing the confrontational issue. I am dreading anyone editing my writing. I was so possessive and sensitive over my (life coaching) website during the writing process, I am sure I will be an absolute nightmare! Having someone edit your stuff is so hard. It took me 30 years to let anyone look at my work, so I knew I would have problems with it. I’ve heard it gets easier though.